Eggs often have a bad reputation, thanks to their high amounts of cholesterol and fat. While eggs' high cholesterol content only presents a health risk to a subset of the population -- those sensitive to dietary cholesterol -- using egg whites in place of whole eggs still offers health benefits. While the egg white may not look like it's packed full of nutrients, it does offer several benefits without a lot of calories. An egg is full of cholesterol, with a single, large egg weighing in with nearly as much cholesterol recommended in your full day's diet. The full 213 mg of an egg's cholesterol, however, is all in the yolk. Eat only the egg white and you're instantly removing the eggs' notoriously detrimental element. People with no health problems should eat no more than 300 mg of cholesterol per day, while those suffering from conditions such as diabetes or cardiovascular disease should eat no more than 200 mg of cholesterol per day. Egg whites are one of the top sources of protein, ranking up there with lean meat, poultry and fish. More than half of a full egg's 6 g of protein, in fact, comes from the white. A single egg white offers 4 g of protein without the yolk's fat and other detriments. You'll get no fat, in fact, unless you fry up the egg in greasy oil or butter. Opting for low-fat protein sources as a regular part of your diet can also reduce your risk of heart disease. An egg is not a high calorie food to begin with, packing only about 71 calories for a single large egg. 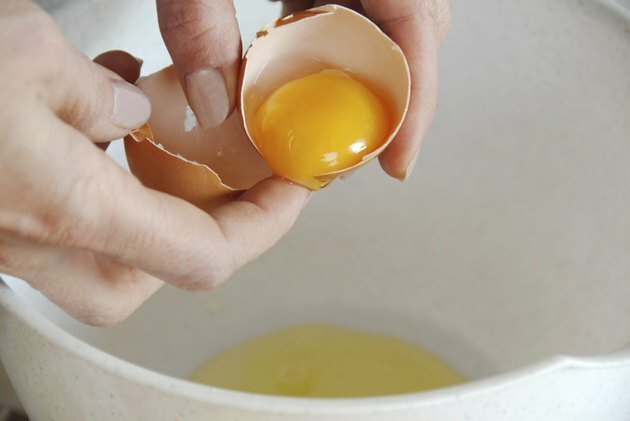 Cut out the yolk and you immediately cut out about 55 of those calories, leaving you with a mere 16 for just the egg white. Rather than cooking up a three egg omelet, try one with a single egg supplemented with two egg whites. The three-egg omelet automatically weighs in at 213 calories for just the eggs, without taking any additional ingredients into account. An omelet made with a single egg and two egg whites, by comparison, weighs in at 103 calories. Egg white also give you a few other benefits. An egg white has absolutely no fat, compared to the yolk's 5 g of fat, 2 g of which are saturated fat. The amount of saturated fat in the yolk fulfills about 8 percent of your daily recommended dose. A single egg white also offers 1.3 mcg of folate, 6.6 mcg of selenium, 2.3 mg of calcium, 3.6 mg of magnesium, and 4.9 mg of phosphorus.